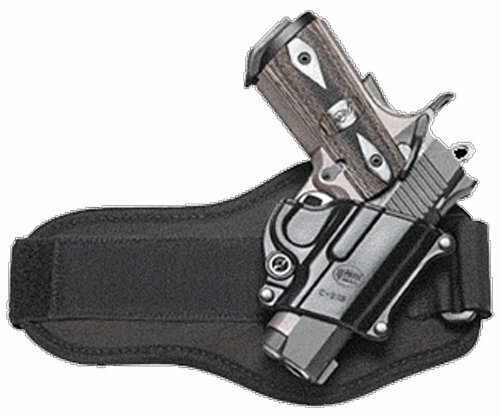 What is the best ankle holster for your LCP? In the table below we list 10 great options that you can consider if you are shopping around for a new one. If you want to see the price and details of any of them, just click on the image. When choosing a Ruger LCP ankle holster there are a few things you need to keep in mind as firearms can be different when it comes to functionality, weight and size. All that will determine whether you will be able to carry concealed, OWB or perhaps even using a shoulder holster. Taking the dimensions listed above into consideration, it is clear that the Ruger LCP 380 is a small gun. That means that there are a wide variety of holster types available to you. Of course, this handgun is ideal for concealed carry. Below we look at 5 ankle holsters for the Ruger LCP that are available on Amazon. We look at the materials that they are made from, the comfort of how they are worn, how they fit the Ruger LCP 380, and how easy it is to draw your weapon from them. This model is made for the Ruger LCP. It has a four inch surgical grade wrap around style and can be worn on the inside or outside of the ankle. We love that it is made in the United States and that it will remain on the leg without much slipping. Other benefits include that it is moisture resistant, lightweight, it is fully lined, and it has a snap release thumb break for a positive draw. The only drawback is that people that use this product need to wear long socks with it to prevent the inside of the holster from irritating their skin. The Galco is made of the finest materials that are presently available on the market. This durable and high quality product is used by law enforcement, the military, and private citizens as well. The wide neoprene ankle band and Velcro closure allows for a person to wear it comfortably with security that cannot be found in any other alternatives. The additional comfort comes from the padding that is made of sheepskin that is located between the holster and the ankle. It is also easy to quickly draw a gun with the assistance of the reinforced thumb break retention strap. A customer has the option of purchasing the adjustable calf strap that is sold separately. However, the calf strap is not required for proper use. This model accommodates ankles up to thirteen inches in circumference and is designed for semiautomatic pistols and double-action revolvers. The Ankle Lite is also offers the options of right or left hand draw and black or khaki finish. 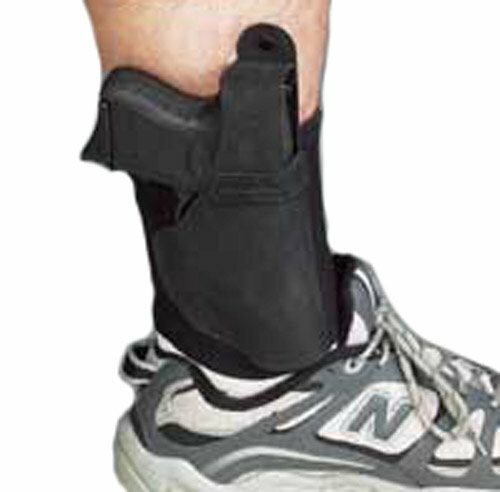 We could not find any drawbacks of this Ruger LCP ankle holster as all that have purchased love their Ankle Lite. One of the benefits of this Outbags model is that it may be mounted on either the right or left leg so it can be positioned towards the hand that will be drawing the gun. Since it is made from the same material as wet suits and scuba gear, it is designed to be very durable and hold a lot of moisture as well. We truly love the other benefits that this Outbags offers. They include: a four inch wide ankle strap that is made from neoprene that will not stretch like elastic straps always do, an adjustable one inch strap that will keep a pistol in its place, and it fits ankles ten to thirteen inches in circumference. The last benefit that we truly love is that it is made in America in Southern California. This product is not only durable, but it also has a downright low price. When it comes to a drawback, the only one that we could find is that it is not meant for small people because it will slide down on them. However, it does mention in the description what size ankles it is designed for. Therefore, people purchasing this Ruger LCP ankle holster should not be surprised by this. This Ruger LCP ankle holder has three-quarter inch suede lined Cordura pad. We love that it comes with a lifetime guarantee and a one-hundred percent customer satisfaction "no questions asked" policy. 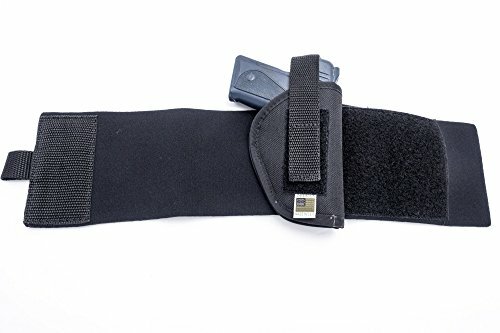 For people that are right-handed shooters, this Ruger LCP ankle holster fits on the left ankle and just the opposite for those that shoot with the left hand. To hold this item in place, it has an adjustable velcro strap. 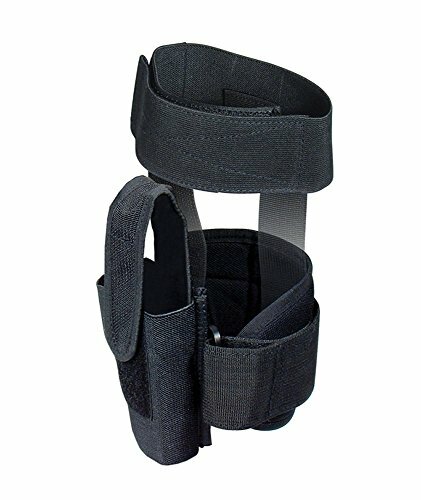 Some people said it feels bulky and like a splint, but the majority of the ratings were very high and a lot of people love this Fobus Ankle Holster. This Ruger LCP ankle holster is a heavy duty adjustable elastic option that is integrally constructed with padding. We also love that it has a padded strap that wraps around and a hook and loop adjustment that ensures that this Ruger LCP ankle holster will fit properly. Other benefits of this model include: an additional adjustable calf strap and double vertical security straps for the most demanding of applications. It fits all compact and subcompact pistols. A lot of customers that have purchased this item said it fits well and is a good value for the money. We reviewed five excellent options, all with their own individual assets and strengths. All of them can either be worn on the right or the left ankle. The Elastic Wrap Ankle Holster and the Outbags holster are both made in America. We think that this is wonderful because some of our fellow Americans are part of the process of making these holsters. They make a living making these products and that helps our economy as well. All of the options are designed for comfort and to keep a gun in place. Some of them also come with additional padding to ensure extra comfort. Therefore, a person that purchases them can wear them for a long amount of time without having to be concerned about whether the gun will stay in place or not. They are also good for those people that have wider ankles due to them having an adjustable strap. Which holster do we like best? We have found a lot of bonuses that come with each one of these choices listed. They are all designed for comfort and to be worn for a long amount of time. One of them is even designed to resist moisture which is ideal for people that will be using their weapon in hot and/or wet environments. After comparing all five of the models, we believe that the best option of the five is the Elastic Wrap Ankle Holster for Ruger LCP. Along with the comfort and ability to be worn for an extended period of time, it resists moisture, is lightweight, and it is also fully lined. The snap release thumb break allows for a gun to be drawn perfectly. It also is made from a four inch surgical wrap around style. A person that wears it also has the option of wearing on the inside or outside of the ankle. We personally love that it is made in America by Americans. That is wonderful for our economy and helps keeps our citizens employed. For these reasons, we believe that the Elastic Wrap Ankle Holster for Ruger LCP ankle holster is the best of these five holsters that we recently reviewed and would recommend it to anyone that is in need of a long lasting and durable holster. Do you like the look of any of these holsters? Or have you at some point even used one of them before? If you have any experience with any of the holsters listed above, tell us about it and what you thought of it. The Top FNX 40 Holster Options Available Today!